B. Put the miraculous medal on the string and pull it to the middle. Step 2. 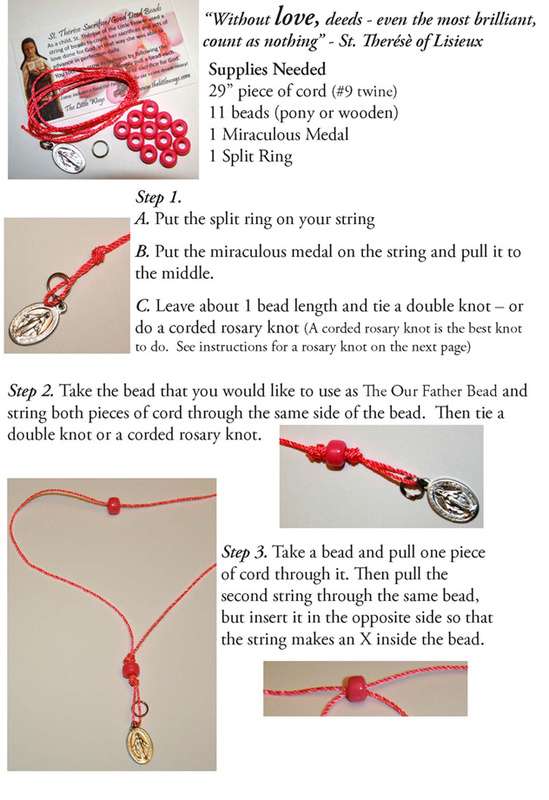 Take the bead that you would like to use as The Our Father Bead and string both pieces of cord through the same side of the bead. Then tie a double knot or a corded rosary knot. Step 3. Take a bead and pull one piece of cord through it. Then pull the second string through the same bead, but insert it in the opposite side so that the string makes an X inside the bead. Step 4. Pick-up your next bead and again form an X with the string through the bead. Pull both cords in opposite directions until the beads are tight against each other. Repeat this step until you have 10 beads in total. Step 5. Leave about 3 bead lengths and tie a double knot. Step 6. Secure your Sacrifice/Good Deed Bead Bracelet to your wrist by tying the string to the split ring. Start pulling beads and doing acts of love! 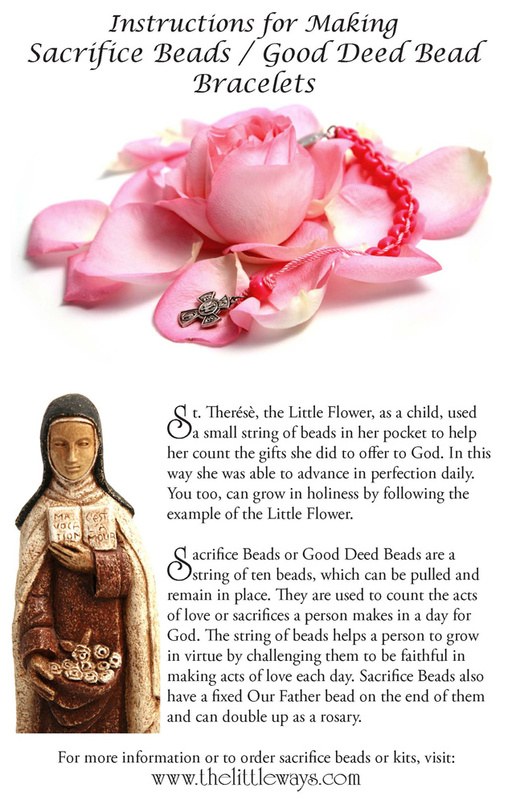 St. Thérèse, the Little Flower, as a child, used a small string of beads in her pocket to help her count the gifts she did to offer to God. In this way she was able to advance in perfection daily. You too, can grow in holiness by following the example of the Little Flower. 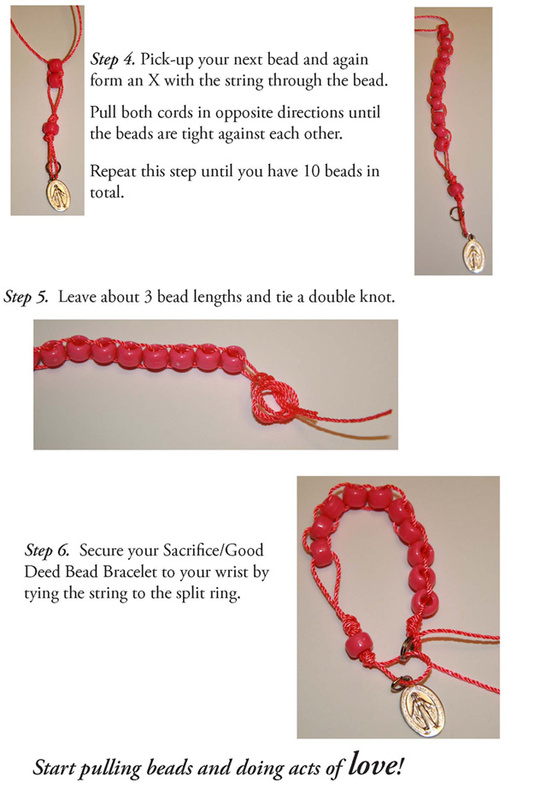 Sacrifice Beads or Good Deed Beads are a string of ten beads, which can be pulled and remain in place. They are used to count the acts of love or sacrifices a person makes in a day for God. The string of beads helps a person to grow in virtue by challenging them to be faithful in making acts of love each day. Sacrifice Beads also have a fixed Our Father bead on the end of them and can double up as a rosary. Copyright 2009-2012 The Little Ways.